Arya learned a new trick this week. When she gets excited, mommy and I get to watch baby clapping while kneeling. Although she can’t quite stand up on her own, Arya can balance on her knees without using her hands. 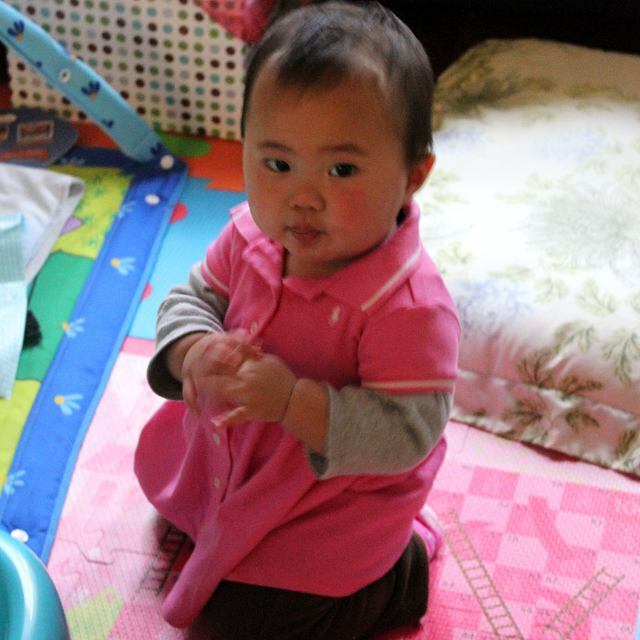 Since baby likes to clap when she is happy, she now combines kneeling with clapping. Her balance is very good when she is paying attention. But sometimes when she claps while kneeling she gets so excited that she gets off balance and tips over. Arya started clapping a few months ago (see when do babies clap), but because it took her so much coordination to clap her hands together she wasn’t able to combine clapping with any other activities. Over time she learned how to clap while standing up balanced against a firm object. Then eventually she would clap while we fed her solid foods. Now that she is starting on the standard development track for walking, Arya is obsessed with kneeling, standing, and balancing. She is proud of herself whenever she can stand up on her own using a solid object or move from one side of the room to the other using the furniture. Recently she began combining her activities so that she is able to control motor skills in her arms and legs simultaneously. Sometimes this occurs as baby drinks milk while standing up. More often she will express joy by balancing on her knees and clapping her hands. There isn’t anything particularly special about baby clapping while kneeling as opposed to baby being able to clap or baby being able to kneel. But the fact that Arya can do both things at the same time makes us feel like we can see her developing a new skill everyday. We also think she looks especially cute she claps excitedly while kneeling on her own.